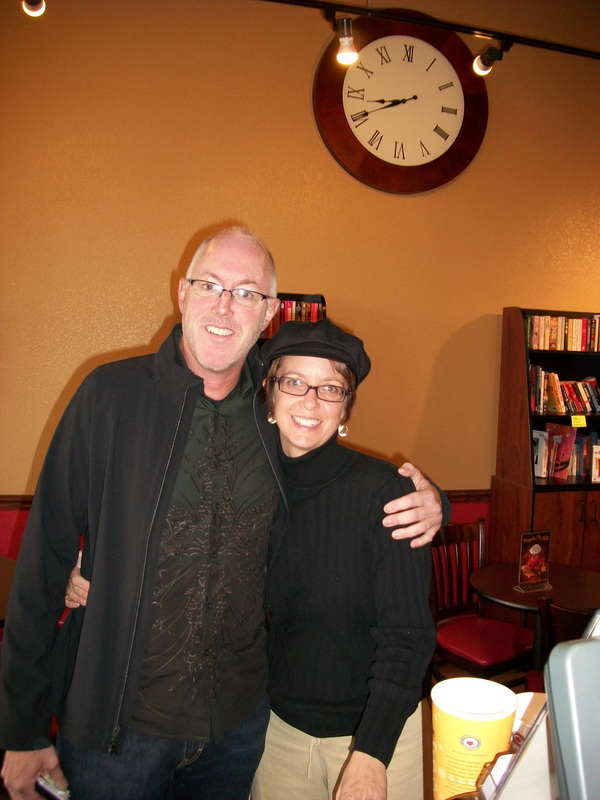 The Catalyst….brewing relationships one cup at a time! The Tap Room and Catalyst Coffee in Fort Collins has become one of my secret hideaways. It’s only hidden for me because I haven’t spent a whole lot of time here, but enough time that a couple of the baristas know that I like to have decaf. As much as I’d like to think I’m special and they warm my cup up just for me, I’m not. For those enjoying their coffee here, it’s part of standard operating procedures. I love it! On my 2008 wanderabouts in the Fort Collins area, I read about Catalyst coffee and the struggles they were going through. I was impressed by reading about how the neighborhood and clients pulled together to ensure they wouldn’t close their doors. Although I didn’t make it here last fall, my bike brought me here quite a few times late this summer. I planted myself at the same corner table every morning and watched the flow of customers come in through the door, order coffee drinks and bakery items, and listened to the “sass” Catalyst is famous for. Some mornings it reminded me of Ed Debevic’s in Chicago…sass. There are even table tents explaining this – “Each order comes with a free side of sass ’cause we love you and want you to feel at home!” I have yet to experience the sass first-hand, but I’m enjoying watching it from my little corner of this world without corners. The coffee. It’s delicious, organic, and free trade. The decaf is even better – they use a swiss water process, so no formaldehyde enters my body. Excellent! The regular is just as yummy and on this beautiful Monday morning, that’s my pick for the day, the regular brew. This is a coffee shop by day and a wine bar with music by night. The community has really stepped up to support this great little hideaway by hosting meetings and events here, picking up a bag of coffee for home brew, and hanging out to listen to the live music. The only regret I have in my visit here is that I didn’t make it last fall when I read about them. I would’ve spent many mornings here enjoying the sass! My Saturday morning wanderabout has turned into an all day coffee shop cruising event. 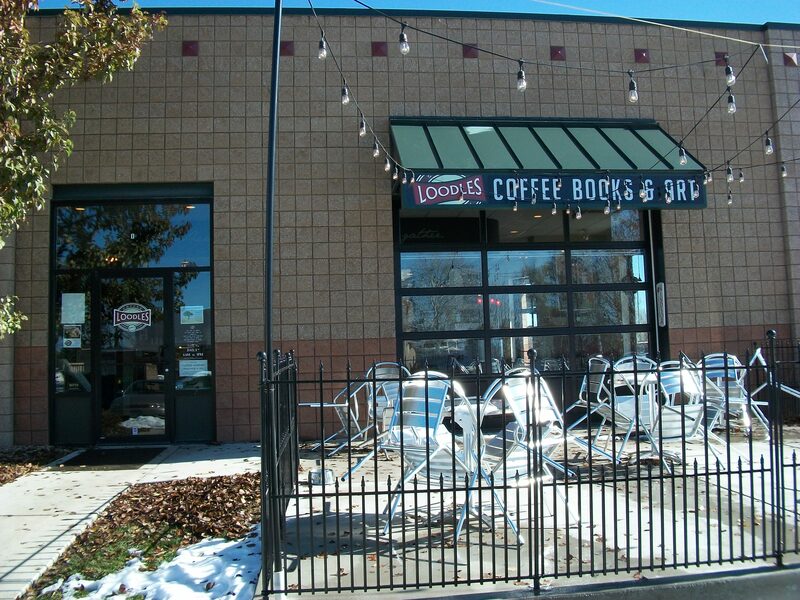 After having lunch at Bruce’s Bar in Severance, Colorado, it was suggested to me that I find Loodles Coffee Shop in Windsor before heading back. 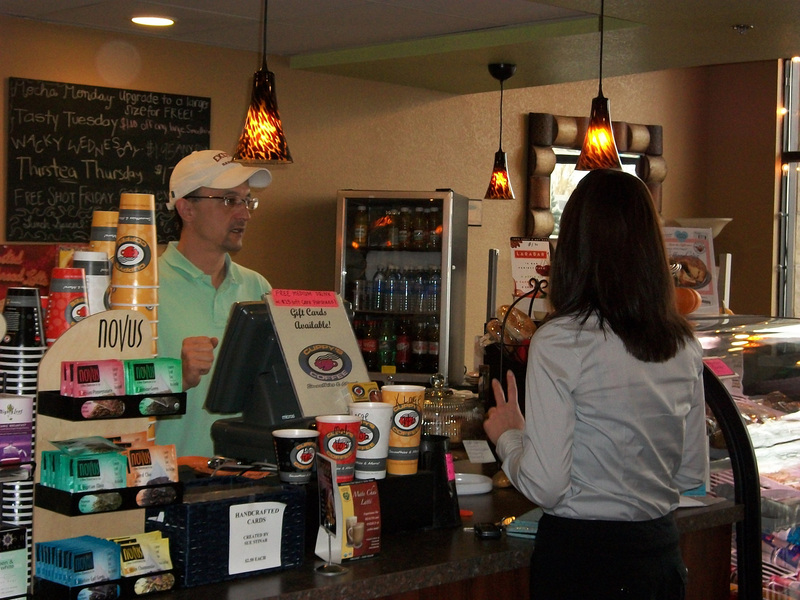 Located on Main Street in Windsor, Loodles is in an attractive small strip mall near the medical center and Hospice. The front entrance is off main street and showcases an attractive patio decorated with lights. Even before walking in it has a tiki bar feel to it. Upon entering the front door, you find that tiki bar coffee station in front of you. Once room has a study-library theme going for it, with a large flat screen TV on the wall. I was please to find the room quiet without the TV on. A couple women were reading some books from the shelves and a man was busy on his laptop. 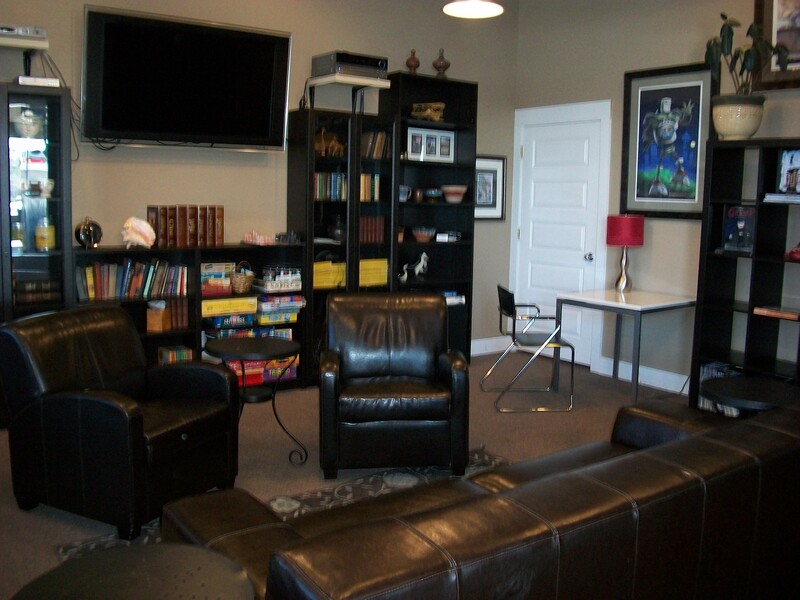 It’s a pleasant, quiet room – a great place to sit on the couch and read a book. 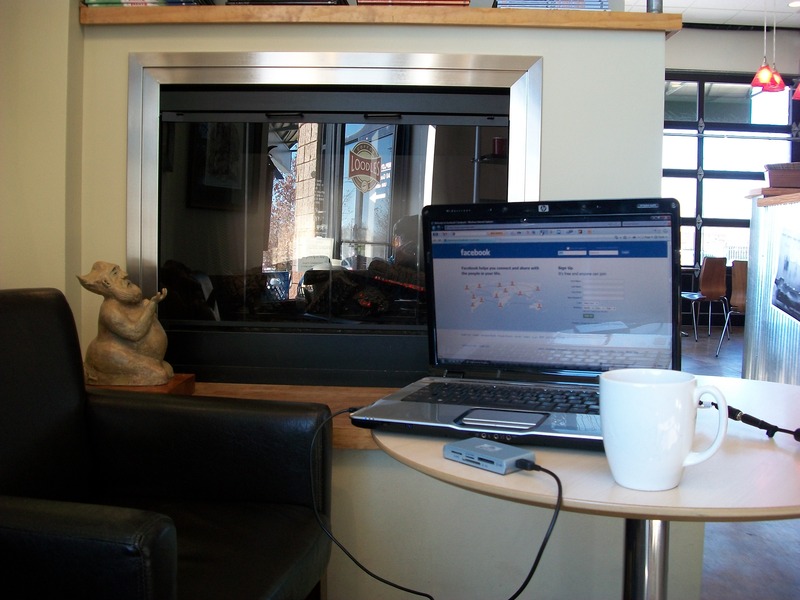 In the main coffee shop is a double sided gas fireplace. I planted myself on the secluded side – where there are only two chair available – one for me and one for my baggage. Located above the fireplace is a very unique selection of children’s books. Upon looking closer at the books, I found they were written by the coffee shop owner, Mark Ludy. Ahh….a little investigation after another cuppa, and it all begins to make sense – coffee, book, and art. Mark is an author and illustrator of children’s books. Now that I have a clue, I’m checking out his artwork and find it very fun and whimsical. You can find his work at www.markludy.com. What a wonderful way to end the day….at a coffee, book, and art shop created by a children’s book author and illustrator on Halloween. I feel like a kid today. Johnstown Java Jams or…Jesus’ Juke Joint? Last night I decided that I would start my Saturday morning with a back roads drive, a cup of coffee, my camera, and eventually a small town coffee shop. It was one of the few nights I slept past 3 am, and woke up shortly after 5. I took my time getting ready, but was out the door within an hour. My first destination was to be a quaint little coffee shop off Taft and Highway 402 in Loveland, but I was unable to find it. What I did “wanderabout” upon was Schmidt’s Bakery where I found coffee and an apple pastry. I believe that I was divinely guided to start my day there. The sun would be my next destination, so I headed east, finding a road that must’ve been muddy yesterday with the melting snow, which was now frozen. This took me on a slight incline where I found myself between two fields – one on the east where the sun was just beginning to rise, the other as the foreground to a view of the Rocky Mountains. Morning heaven. Coffee, apple pastry, Nickelback in the background, and the sunrise. Yes, I’m living heaven on earth this morning. After taking a few moments to enjoy the break of dawn, I hopped back in The Bluebird (my car), and headed toward Johnstown. 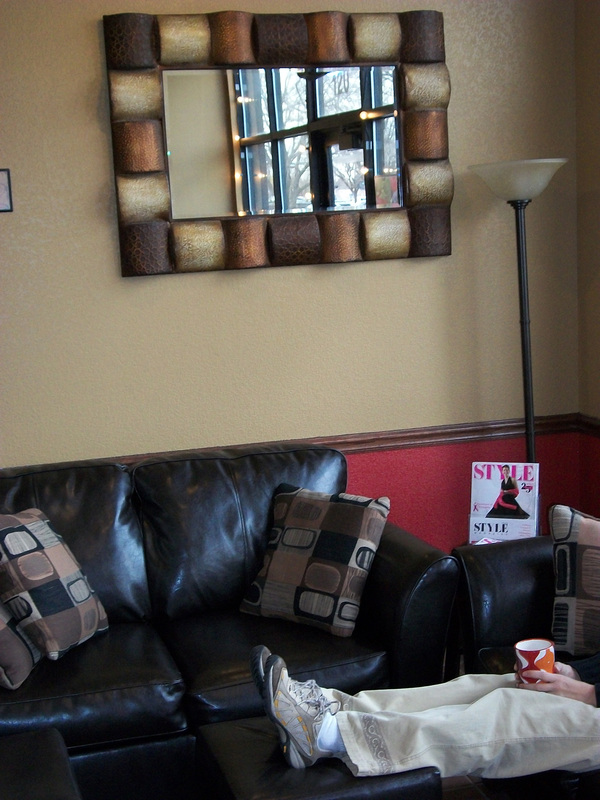 I was able to find an eclectic little coffee shop right away – Johnstown Java Jams. The sandwich board outside caught my eye, so I turned my car around, parked, and headed in for a cuppa. A non-profit coffee shop that features live music on the weekends. Dana, the “coffee shop curator” greeted me and gave me a brief overview, but Larry and Bob, a couple of locals, filled me with information about the coffee house. They referred to it as 3 J’s, and pointed out that it could also be known as Jesus’ Juke Joint and told me about Mississippi Blues roots in that nickname. Music, coffee, and community seem to be what flows freely and easily here. This is a non-profit business that benefits everyone, not just the youth in the area. A retired group meets here on Friday mornings, a young woman who’s working on her undergrad in international business sets up her laptop every Saturday morning, and there’s a group of about eight locals who have gathered around the coffee bar area. Discussions range from family reunions to economics to the coffee itself. What’s so wonderful about the conversations I hear is the lack of pity party about the economy and more about how people are looking at making changes to overcome hardships. What a beautiful, friendly place to sit and enjoy a cuppa for a few hours, just outside the Land of Love. I must say, the people here and around the Loveland area are some of the most friendliest I’ve met in Colorado. 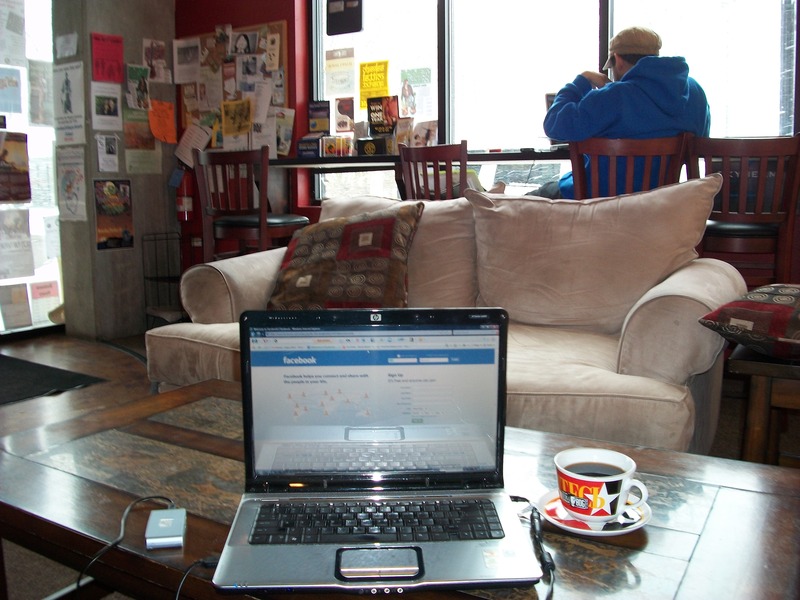 www.3jscoffeehouse.org – Johnstown’s Java Jams! Dazbog Coffee. I first discovered them in a little neighborhood when I lived in Denver, but didn’t begin to appreciate it until I was spending time in Fort Collins last fall. 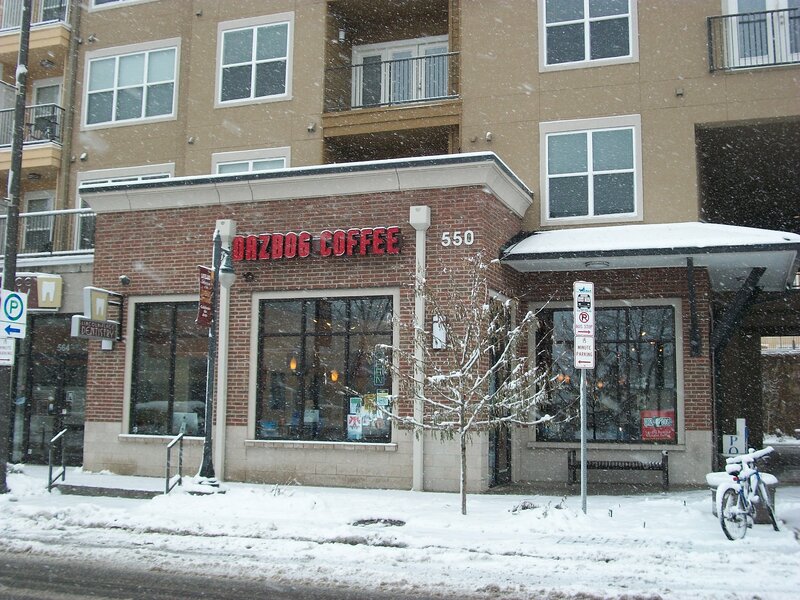 The one near the Poudre River Trail in north Fort Collins is still my favorite Dazbog. Today my ‘snowstorm day off from work wanderabout’ took me to the Dazbog at 556 Lincoln in Loveland, Colorado. 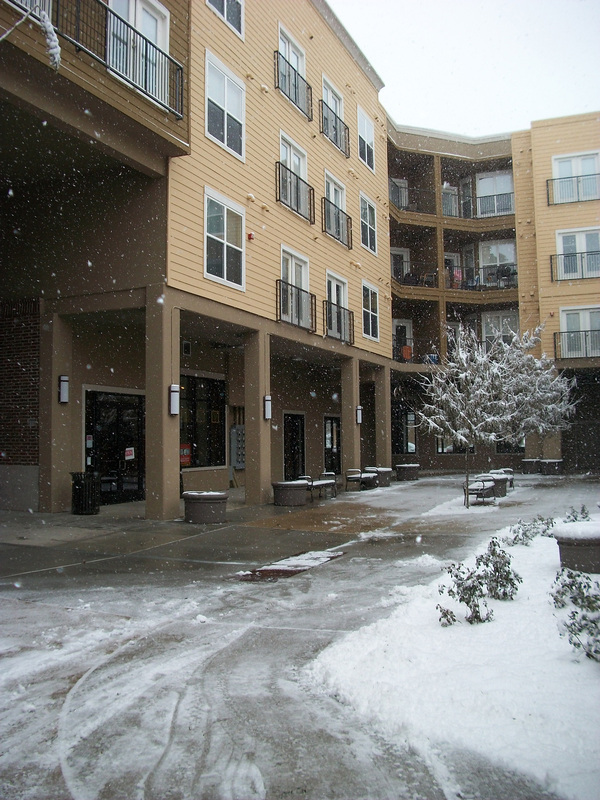 Unlike the one located on Eisenhower in Loveland, this one has plenty of windows on the west, south, and even east side of their space. I love the light and openness that windows provide. I’ve been here almost three hours, writing, listening to music, playing on Facebook, and watching the snow fall….it’s a beautiful thing. This coffee roaster/franchise coffee shop is the manifestation of an American Dream by Leonid and Anatoly Yuffa, and is based in Denver, Colorado. According to the website – www.dazbog.com, the Yuffa family fled Russia to pursue a better life of freedom, democracy, and opportunity. I don’t know if they have the best coffee, but what I am fond of is the customer service at the few Dazbog locations that I’ve been to. I don’t know if it is the corporation or the franchisees that create the service standards here, but I’ve found the coffee shops to be warm, inviting, and full of color and cultural flavor. For me, a good coffee shop is one that I can sit in for three hours and it feels like only a few minutes. This visit is fast approaching the four hour mark. The Merchant Voyage…words are flowing out across the universe. Words are flowing out across the universe. The shop owner, Mary, told me that she found some old flashcards and decided to make her own and use phrases from Beatles’ songs. An entire tree was decorated with these phrases and elegantly draped ribbons. I would love to have a room decorated like this, where I could retreat to when I need inspiration, affirmations, or just a dose of whimsy. Merchant Voyage is a little gift store located on Fourth Street in downtown Loveland, Colorado. Taking up two storefront spaces, you can find books, cards, jewelry, embroidered ribbons, candles, ornaments – whatever you imagine or don’t imagine! It’s a great place to find unique gifts for yourself or others. Located in downtown Loveland, this is a great place to spend time wandering through coffee shops, restaurants, theatre, galleries, boutiques, and gift shops. During the summer there are many weekend activities from art walks to BBQ events in the streets. It’s a hoppin’ little town just north of Denver and east of the Rocky Mountains. I feel like I am on my own little voyage, on the long and winding road through life. The Loveland Coffee Company could almost be one of my ‘secret garden spots’ in Loveland, Colorado. Located in a small strip mall on 29th Street, I’ve passed it many times without considering stopping. Yesterday I decided to give it a shot and was pleasantly surprised. Inside I found the decor very pleasing. The colors are are my favorites (actually, all colors are) – warm, dark caramels, olive greens, chocolate browns – colors with food names! 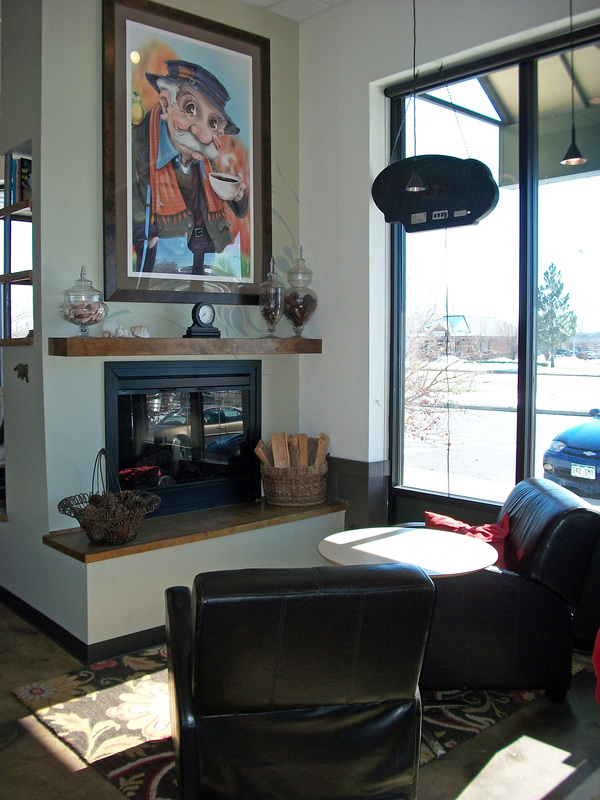 Cozy sofas, big chairs, a gas fireplace, and plenty of tables and chairs. The staff is very welcoming. I’m an in-house coffee drinker and both days was offered to have my cup warmed up. What a nice gesture! This is something I’ve noticed only once before, and that was at Catalyst Coffee in Fort Collins. At Catalyst, they don’t ask, they just automatically warm it up with hot water. I could live here. In fact, I think I was here yesterday for four hours and today I’ve already been here over two. My comfort level hanging out here might be too high – I don’t want to move. Thank goodness I have dog responsibilities today, otherwise I’d probably be here through the lunch hour. Although most of the morning they’ve had a full house of in-house and to-go traffic, it never felt too busy. The mix of people flowing through here is both diverse and interesting – farmers, professionals, grandparents with a grandchild, friends, singles, and parents with young children. I love the people watching opportunities here. 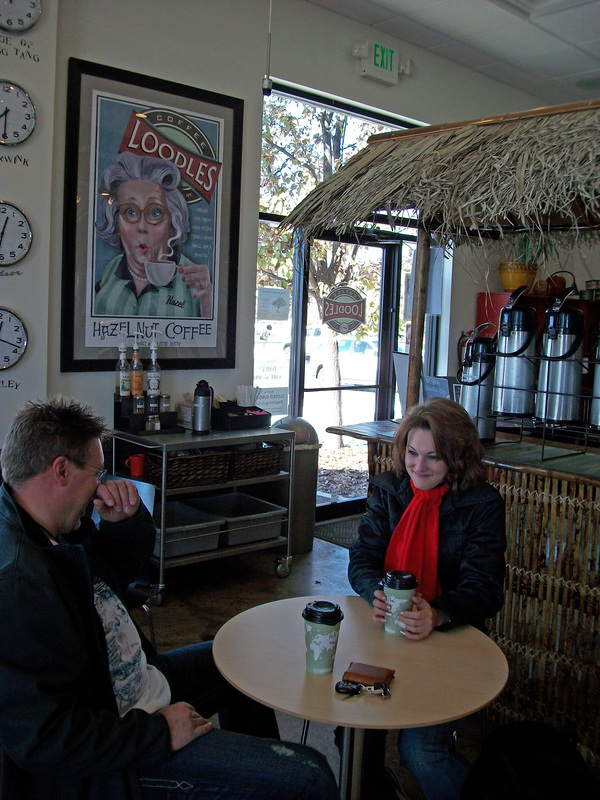 There are so many beautiful connections that happen here…in the Land of Love…at the Loveland Coffee Company! This little hideaway is now on the top of my coffee shop cruising destinations!